Calcium Hydroxide is widely used in endodontics for a number of purposes. Its antimicrobial properties are attributed to its high pH (basic), destructive effects on bacterial cell walls and ability to dissolve organic tissue. It is used routinely as an intracanal medicament. It is also used for apexification, apexigenesis, treatment of root resorption. Ca(OH)2 used in endodontics is made with Ca(OH)2 powder, a vehicle and a radiopacifier. Most common radiopacifiers are barium sulfate, bismuth or compounds containing iodine or bromine. While radiopacifiers make the calcium hydroxide more visible radiographically, some radiopacifiers are known to resorb at a slower pace, sometimes making it difficult to see the subtle changes. While the control of a paste material at the apex of a canal can be very difficult, the resorptive properties of calcium hydroxide make it a very forgiving material. 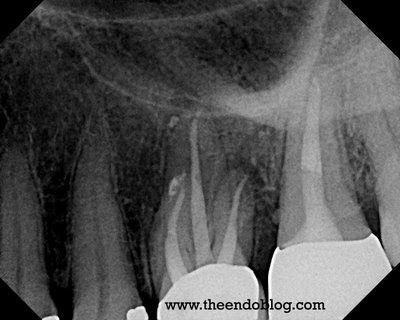 Extrusion of calcium hydroxide past the apex of a tooth is not uncommon. In fact, there are some who would recommend deliberate extrusion in the case of a large, chronic periapical lesion to help in the healing of such a lesion. 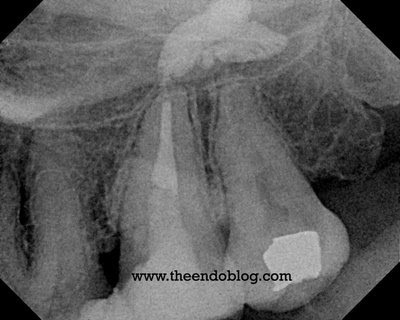 Calcium hydroxide (Ultracal - Ultradent - 35% Ca(OH)2 with barium sulfate) was used during treatment of this tooth to control exudate prior to obturation. A significant amount was extruded past the apex in close approximation to the maxillary sinuses during the endodontic treatment. 14 months later, the patient returned for treatment of #14. Our recall radiograph of #15 shows complete resorption of Ca(OH)2. The patient had no complaints and is in full function. Estoy administrando un blog de periodoncia: PERIOBLOG donde encontrarán artículos, presentaciones, etc referidas a la periodoncia. También estoy empezando un nuevo blog: ODONTOLOGÍA ACTUAL donde pongo a disposición artículos en inglés traducidos al español. También pueden enviar artículos (en inglés) que deseen que sean traducidos. También hay una encuesta para elegir los próximos artículos a ser traducidos. Thank you for maintaining your blog, I check it regularly and find it quite an interesting resource for broadening my understanding of endo therapy. I have a question regarding your position on other medicaments; specifically what are you thoughts on the use of cortocosteroid/antibiotic pastes and cements for treating emergency cases or near pulp exposures? This is a very interesting resources of endodontic topic. It's very informative. Thank you for sharing this. Dentistry makes our oral health achieve its best.